Discussion in 'Gen 2 Prius Main Forum' started by Dbryant1732, Jul 5, 2018. NortTexSalv04Prius and Mendel Leisk like this. The basic instruction came from the Hains manual. 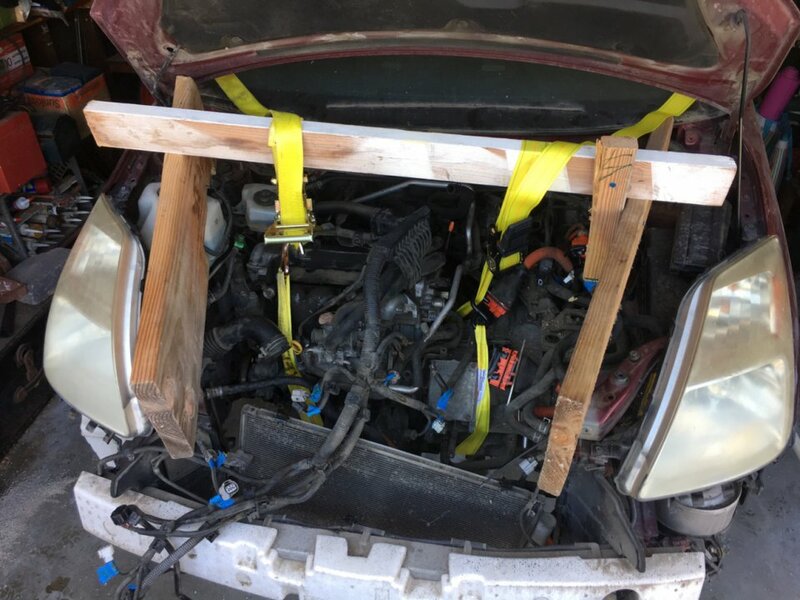 I liked it because I found out I didn’t need to Mess with the a/c, just take out the radiator and unbolt the compressor and tie it up out of the way. Yes, you do take out the four bolts and lower the steering rack being sure to tie of the steering wheel and mark the steering knuckle, putting this back in place with my daughters help was easy, doing it myself controlling the hydraulic jack on the garage floor from the drivers side it took an hour of doing it wrong before I got it right. Oh the wood wedges to keep it from falling over and smashing the lip pan was brilliant. I think the bees knees is a hoist above, especially one that is on a trolley, capable of moving fore and aft about 6 feet, so you can lift straight up, then bring it forward clear of the front bumper. And hopefully the setup doesn't collapse your garage roof. Skibob and Mendel Leisk like this. thank you Paul for the pictures and notes (I didn't know how to reply to the email). Seems like quite a bit of work I am surprised you were able to drop it so quickly on the 2nd time. I wonder if one could split the engine from the transaxle on the car and avoid having to drain the transmission fluid and disconnect all those lines and hi voltage harness? As someone who has done it both ways I can assure you dropping the unit down is both safer and quicker. Paul Schenck and Mendel Leisk like this. Having my daughter there to read my notes and the steps in the manual, hand me tools and remind me as I did the operations was helpful. Also her little hands to take that back transaxle connector off from the wheel well saved an hour. I spent half a day just engineering the gantry out of scrap lumber the first time. As to your question about separating them befor to avoid Transaxel fluid drain? Not what I did as removing the drive shafts would have made a mess and it really wasn’t hard. I used the bucket you see and clamped the hoses off to avoid a complete drain. Then after the exchange it was a simple matter off filling it up as needed. 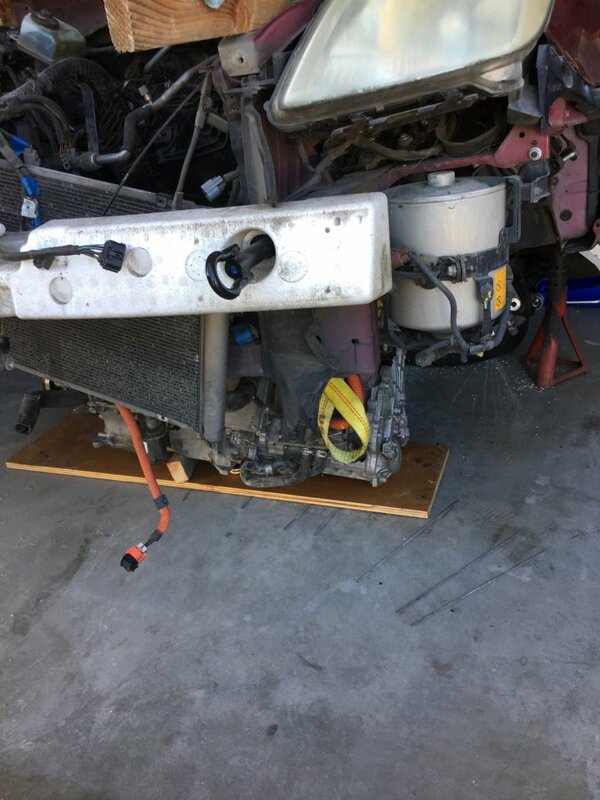 Engine Swap - change transmission also? Prius Engine Swap job near Chicago area.